The tropical wave which has been moving westward across the Caribbean has been declared a tropical depression by the National Hurricane Center as of 6 pm EDT. If it develops further, it will become Tropical Storm Alex. This could happen as early as tonight or Saturday. The forecast track brings the storm across the Yucatan Peninsula and then into the southern Gulf of Mexico by late this weekend. Based on the expected track, there is at least a 5% chance of tropical storm force winds nearly anywhere in the western half of the Gulf in the next 5 days. Earlier this afternoon, CNBC reviewed the possible impacts of a tropical storm on the BP oil gusher cleanup and oil markets. "The timing couldn't be worse." See here for more Washington DC weather records. See here for June 27 update. 1 AM Update: It's not official, but the new record high minimum temperature of 78° appears to have held. Note that the Atlantic City record was broken by 3° in an observation history which extends back to 1874. It's still 90° in Washington at 7 pm. All of them are new records by 2° each. The previous Baltimore record had occurred 3 times in the past: 1966, 1908, 1894. The Washington morning low of 78°, if it holds through midnight (1 am EDT), would also be a new record high minimum, beating the old record of 77° which has stood since 1874. Given the lack of rainfall so far, that seems like a distinct possibility. The 1874 record is the oldest of only 3 remaining 19th century daily high minimum records for June. A daily high minimum record (76°) has already been set this month on the 21st. June 25 Update: Yesterday's record high of 100° and record high minimum of 78° bring the month-to-date average up to 79.9°, 6.1° above average and half a degree above the old June record. June 23 Evening Update: Today's preliminary high temperature was 97°, giving a departure from average of +10°. The record warm June temperatures extend at least as far south as Richmond, where the monthly average to date of 80° exceeds the record of 79.2° in 1943. June 23 PM Update: With a 1 pm temperature reaching 94° following a morning low of 74°, the daily average so far today of 84° pushes the June mean to at least 79.4°, tying the June record in 1994. This is now the 5th consecutive 90°+ day and the 12th so far this month. 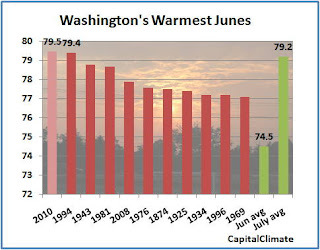 Washington's high temperature of 96° on Tuesday was well short of the record for June 22 of 101° in 1988, but the day's average of 85° was 9° above the normal for the date. This raised the monthly average so far by 0.3° to 79.3°, just 0.1° below the all-time June record set in 1994 and 0.5° above the second-warmest June in 1943. The long-term average temperature for June is 74.5°. There have now been 11 days in June with high temperatures of 90° or above, including the last 4 consecutive days. Since the average number for the entire month of June is 7.4, this is a little more than double the normal ratio of 90°+ days. June 22 Update: The New Zealand Met Service blog reports phenomenal rains in the early part of June (tip of the wind vane to Hot Topic). The Northern Hemisphere is not unique in experiencing recent heavy flooding. Dozens are known dead, hundreds are missing, and perhaps as many as 100,000 are homeless following several days of torrential rainfall, as much as 14", in northeastern Brazil. Flooding is reported to have destroyed entire villages in the states of Alagoas and Pernambuco. June 22 Update: The Caribbean tropical wave has not become better organized today, so the chances of development in the next 48 hours have been reduced to 20%. However, environmental conditions are likely to become more favorable for slow development as it continues to move westward. Celia, which became the first hurricane of the 2010 Eastern Pacific season early Sunday afternoon, has reached Category 2 strength as of 8 pm EDT today. The storm is centered a little over 500 miles south of Manzanillo, Mexico. It is moving west at about 8 mph. Although a more northerly track is expected later in the week, Celia is likely to remain well offshore. Meanwhile, in the Atlantic Basin, a strong tropical wave in the central Caribbean is now given a 50% chance of developing into a depression in the next 48 hours. If a storm does develop, it has the potential of eventually moving northward into the Gulf of Mexico. Global temperature records extend back 130 years to 1880. For the month of May, most of the world's land areas were warmer than average, especially eastern North America, eastern Brazil, Scandinavia, eastern Europe, equatorial and southern Africa, eastern Russia, and southern Asia. Temperatures in eastern North America, for example, were 2°C (3.6°F) to 4°C (7.2°F) above normal. On the other hand, temperatures were below average in western North America, northern Argentina, western Europe, and interior Asia. Ocean temperatures for May were also considerably above average by 0.55°C (0.99°F). This was the second warmest May for sea surface temperatures behind 1998. These warm averages occurred despite the cooling of equatorial Pacific temperatures, signaling the end of El Niño conditions. In the Northern Hemisphere, rapid spring melting resulted in the lowest snow cover extent since satellite observations began in 1967. Average snow cover for the month was 4.3 million square kilometers (1.7 million square miles) below the long-term average.